Bed prep: Prepare beds by adding compost at 1/3 volume and SROF at ¼ - ½ cup per square foot. Mix well by spading. Planting: Arugula will tolerate a variety of soils and is not a heavy feeder. Make a shallow furrow, scatter seed thinly, no closer than 1", cover 1/4". Thin to 6" when plants are 1" tall. If you prefer very young leaves, you can space them 3" - 4" apart. Arugula needs light to germinate, do not exceed recommended planting depth. For Square Foot and wide row gardens, make a depression in the soil surface, plant a pinch of seeds and cover lightly. Tamp and keep moist until germination. Aftercare: Keep bed free of weeds – mulch. Watch for disease or pests. Harvest: Younger leaves are preferred - harvest anytime leaves are 2" or larger. Flavor becomes more pungent with size and age, determine your preferred range. You may harvest older, outer leaves and allow further growth, or pull up the entire plant. Arugula does not store well, use within 2 - 3 days of harvest. Arugula Pests: Flea beetles - row cover, insecticidal soap; cabbage worms - row cover, Bt. 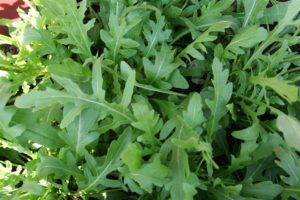 Additional Information: Arugula can be grown in full sun in the cool season but should be grown in partial shade in the summer. Arugula is a great succession crop. Plant 3 - 5 plants per person every two weeks for a continuous harvest. If your arugula bolts, harvest the flowers to use in salads. Many people prefer the flowers because they are not as spicy as the leaves. History: Ancient Romans used arugula seeds to flavor olive oil. Charlemagne declared it a suitable potherb for growing in gardens in an 802 AD decree. It was also used historically as a sexual stimulant. Often called Rocket or Roquette.